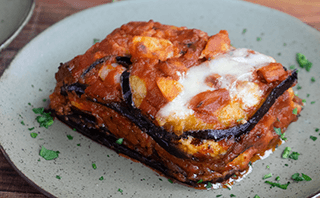 This Eggplant Parmigiana Recipe is a scrumptious dish of layer upon layer of crisp, juicy eggplant mixed with rich Italian tomato sauce and filled with parmesan cheese and fresh gooey mozzarella. 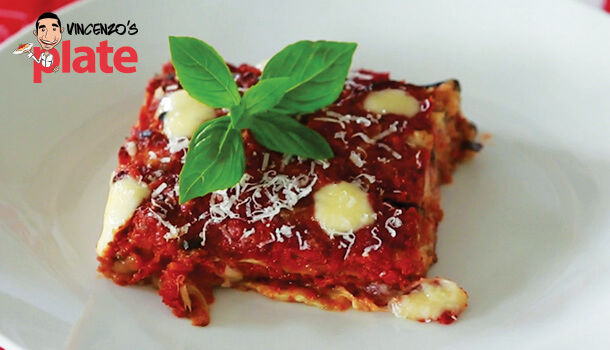 Eggplant Parmigiana is one of my most favourite childhood meals so what better way to introduce a special series featuring my MAMMA than with this dish. 1. Cut the eggplant length ways into strips. 2. Line them up in a bowl and sprinkle salt over the top of them. 3. Leave this to rest for 20 minutes to get rid of any excess water and bitterness. 4. Pour some plain flour onto a sheet of alfoil. 5. 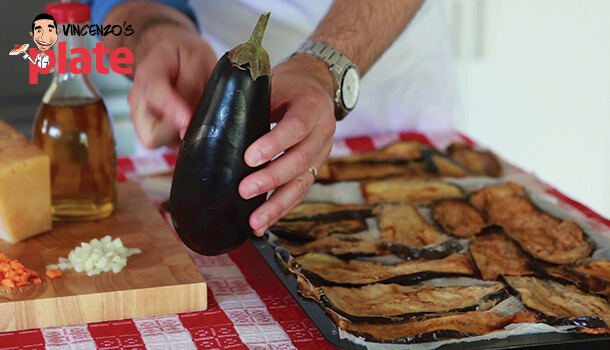 After you have lightly dried each strip of eggplant using a paper towel, batter each side with flour, pressing down gently with your hands. 6. Once you have finished, heat up some vegetable oil in a frying pan and fry each strip until it starts to brown. 7. Remove it from the pan at this point and put it onto a tray or large plate which you have lined with paper towels (these will help to get rid of the excess oil). 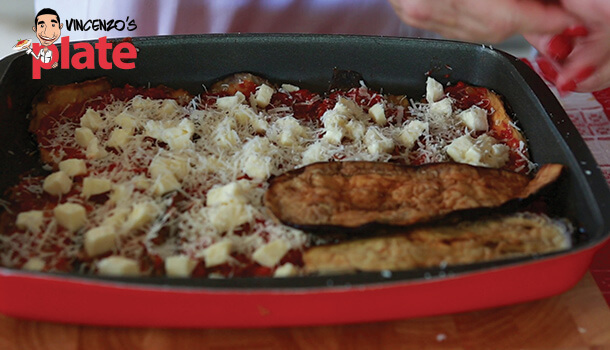 VINCENZO’SPLATE TIP: For a healthier eggplant parmigiana option, you can boil or grill the eggplants instead of frying them…but I’ll warn you, the taste is just not quite the same. 1. 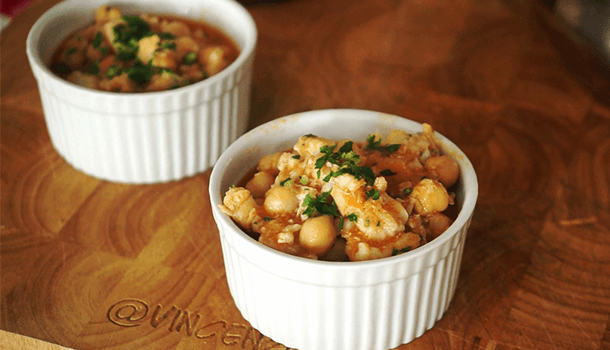 Add a nice amount of extra virgin olive oil (EVOO) to a deep pot or saucepan. 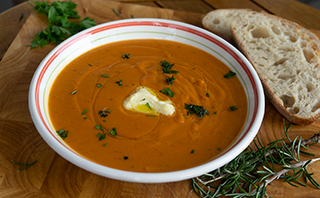 When it heats up, add the chopped carrot and onion and cook until golden. 2. Add the tomato polpa and a pinch of rock salt before stirring well. 3. Add some fresh basil leaves and stir them through. 3. Cook the sauce for around 20 minutes or it will thicken too much (this will continue to cook later when you add it to the dish and put it in the oven). Continue to stir the sauce every few minutes. 4. Remove the sauce from the stove. 2. 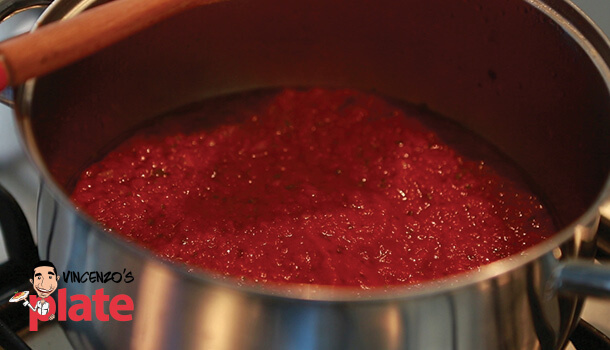 Using a ladle, put small amounts of sauce all over the bottom of your baking tray. Spread it out with the bottom of the ladle so it’s not too thick. 3. 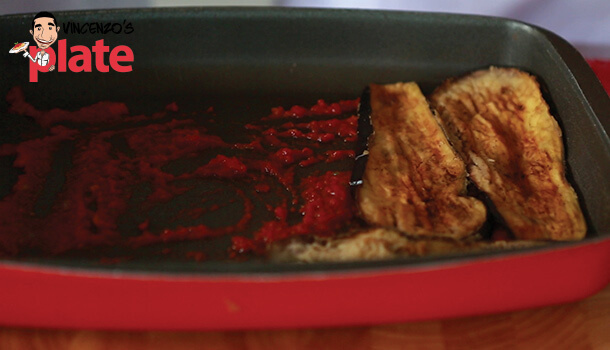 Begin to layer the strips of eggplant at the base, one by one next two each other and trying not to leave any gaps. 4. Spread some more tomato sauce on top, this time being a little more generous and be sure to add sauce into all four corners so it doesn’t dry out and burn when it’s in the oven. 5. 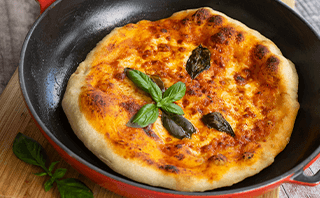 Sprinkle a generous amount of mozzarella over the top and then grate the parmesan over it. 6. 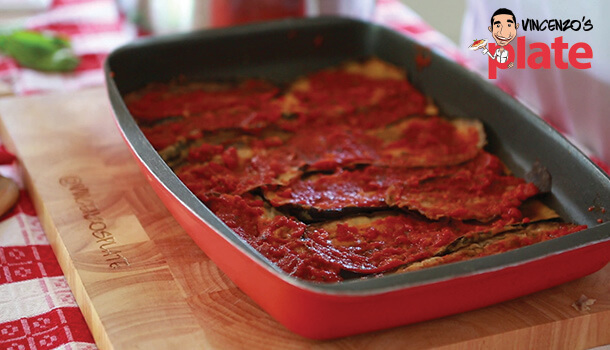 Next, add another layer or eggplant strips over the top and repeat the process. 7. Repeat this once again but don’t add the mozzarella when you get to the top, just the parmesan! 8. 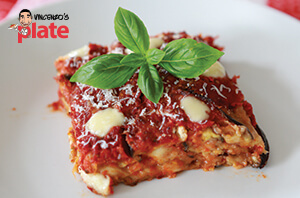 Put the eggplant parmigiana in the oven for between 30-40 minutes, dependent on the oven strength. 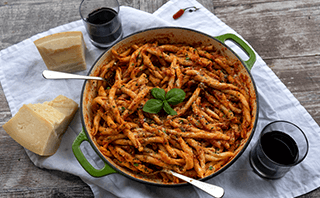 Wait around 15-20 minutes for the eggplant parmigiana to cool before serving and then cut it into strips or squares for your dish. 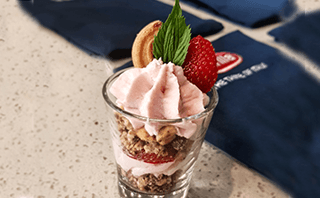 You can also garnish with some basil for a finishing touch. E ora Si mangia, Vincenzo’s Plate!! !